CREATED FOR MAKEUP ARTISTS, BY MAKEUP ARTISTS. fastFX by Dermaflage was expertly developed by top Hollywood special effects makeup pros to meet their unique challenges on set. The best SFX makeup must deliver consistent results under high-pressure, quick-changes and time crunches. Leading SFX makeup artists tested and perfected the easy-to-use on skin silicone until it exceeded their expectations and became a staple in their own kit. The result is an innovative yet user-friendly special effects solution that is used by some of today’s most acclaimed film and TV makeup professionals. 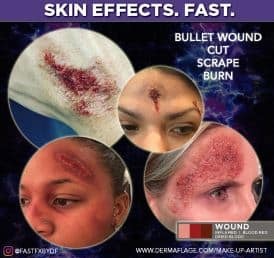 Now, fastFX by Dermaflage makes this industry-insider secret available to all makeup artists to create realistic dimensional injuries and skin effects. Whether you’re working on a production, building your portfolio, or stocking your Halloween makeup kit, fastFX by Dermaflage can give you a creative edge that other special effects makeup products can’t. The SFX Makeup That’s Super Fast & Easy To Use! When there’s no time for molds, cast latex, or silicone prosthetics, fastFX by Dermaflage is the out-of-the-kit solution. Create fast, realistic, dimensional injuries and skin effects.